I should have known from the outset that this was going to be a slow walk in which we did not go very far. First there was the large roll of drawing paper that Kim removed from her bag just at we reached the beach, indicating a significant commitment to mapping the details of our walk. Then there was the duck’s head poised pathetically on the sand between the mouth of Towradgi Creek and the sea. The number of photos that we took of this head – before we’d scarcely taken a single step along our journey from sea to escarpment – indicated a through concern with every small, accidental feature of our walk; a concern that would necessarily affect the nature of the walking, slowing it down, shaping it more as a whimsical environmental survey than as a walk. I should explain that I have nothing against engaging in surveys. Furthermore, conceiving our project as a series of surveys makes good sense. If nothing else it is well suited towards producing all kinds of data and artefacts that lend themselves towards being assembled into an art exhibition. But conducting a survey is not quite the same thing as going for a walk. A survey may involve walking, but it is not directed towards walking as such. Walking simply becomes a means of locomotion that assists in making observations and obtaining samples. My interest and aesthetic commitment to walking is different. I am interested in it precisely in terms of the tension it engages with processes of representation. Walking entails a willingness to let things slip by. I am simply walking. If I take a photo or pick something up along the way it is always positioned as a brief interruption to a process that entails continuing, rhythmic movement. On the whole I am more interested in recalling walks than in recording them, and in recalling them I am always aware that the experience of the walk itself escapes. This is an essential and compelling part of the process. I must also confess that for me walking is a means of negotiating a relationship between my inner world and the wider environment. The dialogue this involves is not primarily social. Very often I go on walks alone. It is a form of private experience that forces me, at the same time, to engage with aspects of the world beyond myself. I am very aware of how this corresponds to aspects of romanticism and the dramaturgy of bourgeois identity, but can hardly deny or altogether resist this ideological conception just by acknowledging its historical basis. This is not to say that I am unwilling to walk with other people. I often enjoy doing this (and often find myself longing for a companion), but it never quite engages with what captivates me in walking. My issue then: I must somehow come to terms with walking with other people up creeks. It is not quite the walking I know. Actually it is not just dealing with my fellow walkers that is the issue, but also having to engage with the various land owners whose properties abut creeks. While Kim and Lucas, bold souls, are happy to walk through all manner of fenced and unfenced, dull and fanciful, overgrown and carefully tended creek-side backyards, I am always keen to avoid such trespasses wherever possible. While they are precisely intent to explore the boundaries between the creek as public property and the uncertain proprietary delineation of a backyard, I am much more focused on discovering the easiest pathway upstream. The fewer the backyard encounters, the fewer the physical and institutional impediments, the better. I have no other wish than to flow upstream like impossible water. So I am proposing another strand of WOTI practice, one that genuinely involves walking (according to my evil and misguided conception of the term) and that may even, at times, involve solo walking events, which will of course be properly described here – demonstrating due regard for the social nature of our project. 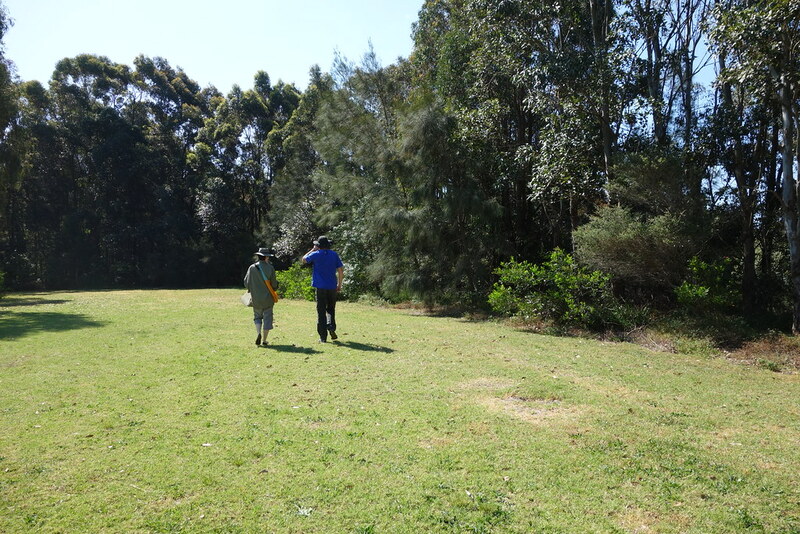 I am distinguishing then between two branches of the WOTI project: SWOTI (Surveying Waterways of the Illawarra) and WWOTI (Walking Waterways of the Illawarra). The latter includes a sub-branch, SWWOTI (Solo Walking Waterways of the Illawarra). I am aware that these acronyms may confuse project members and participants, as well as the wider public, but believe that they are ultimately useful in terms of designating real differences in orientation and approach. I would include a photo of the duck’s head, but did not take one. I hadn’t previously thought of my own way of walking like that – but you’re right, compared to “walking as walking”, which you espouse, my own preference (hitherto unconscious) seems to be for a more instrumentalised version of the walk. Walking for me is a means to discover something. I guess that’s implicit in the notion of ‘ground truthing’ – we go on the walk in order to uncover the truth about something that has up to now only been mapped in a general way, or in a rudimentary way, or in a way which is restrictively practical. Our walk hopes to contribute something new to the map, something about micro-observations, and of course other senses come into play (things heard, smelled, social interactions, etc). When we walk like this – for example in this Towradgi Creek walk – our openness to mapping these other things actually floods our sensoria. There’s no limit to the amount of things we could put on the map, but there is a limit to the size of the nib, the size of the sheet of paper, and our capacity to keep going without a toilet or food break. I experienced a concrete case of this very early in our Towradgi Creek walk – where I was interested to know how many steps separated the shoreline from where the creek petered out into the sand. (It was 39 steps.) And then Kim suggested that I should operate as a human step-counter – my strides could be used to distribute, somewhat accurately, the phenomena encountered on the walk, so we could plot them on the map. But after about 180 such steps I stopped counting – because when counting, I could only count – I couldn’t chat, observe, photograph, even think about anything except counting my steps. It wasn’t much fun. Thus, walking in this way, there’s a constant sense of anxiety – what has been left off? And also – if we include too much stuff, eventually our map isn’t very useful at all (recalling Borges’ tale of the map whose size approximates the territory itself). All of which makes YOUR brand of walking, Brogan, (WWOTI or SWWOTI) seem quite attractive. It’s becoming apparent that not only do we have many possible creeks to walk but also that we have many possible ways to walk them. Certainly I reflected after the Towradgi Creek walk that perhaps I needed to do something more strenuous before or after our creek walk to burn off some energy. Like walking up Sublime Point – something to tire me so that I could then happily focus on the slowness of the process of creek discovery. Perhaps we could adopt the WWOTI and SWOTI methods at different times. I personally would prefer that we all walked together, but in order to cater for individual interests, we could even do a combination walk: we all begin at the same point, Brogan does a SWOTI, while we do a standard WOTI walk, then report back to each other on these experiences. Brogan, I’d like to throw you a challenge to walk a whole creek without stopping until the creek has disappeared. I’d be quite happy to join you on this kind of adventure sometimes.